Ein Tag mit Ausschlafen und ohne Hektik und schon sitze ich wieder am Basteltisch. Endlich. Und da kam mir die laufende ABC Christmas Challenge gerade recht: Q is for Quilting. Man soll also mit Papier einen Quilt/Patchwork nachempfinden. One calm day and sleeping in (sort of) late and I get a chance to sit down in my creative nook again. Finally. And the current ABC Christmas Challenge is perfect: Q is for Quilting. 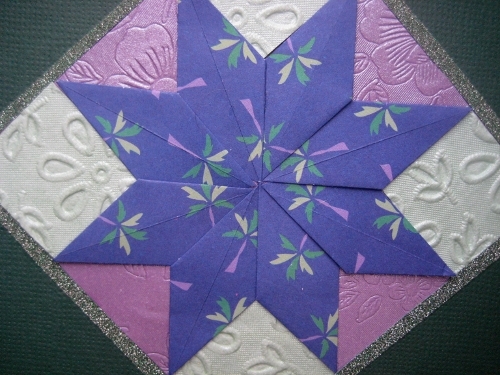 Paper quilting, that is. Abgesehen von der Sternform nicht zwingend weihnachtlich… aber je länger ich auf den glitzernden Rand schaue, umso überzeugter bin ich. Bis bald! Apart from the star shape it isn’t necessarily Christmassy I guess… but the longer I look at the glittery frame, the more I like it as a Christmas card. Take care! Your card is lovely, and could easily be a Christmas card. I love your star shape. Thanks for joining us at the ABC Christmas Challenge this week. So lovely Barbara … the quilted look is fabulous! 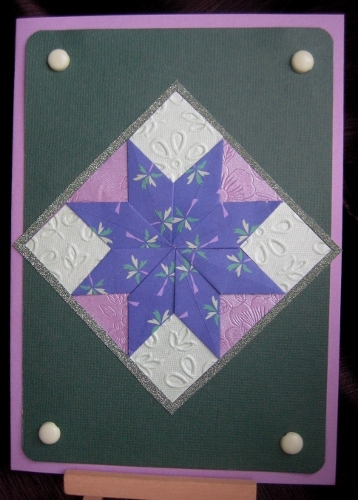 Wonderful card – love your star shape design! Thanks for playing with us at the ABC Christmas Challenge!